The Day of the Ninja was founded in direct response to International Talk Like a Pirate Day, celebrated every year on September 19. This pirate holiday has been going on since 1995, but the holiday didn’t achieve widespread renown until 2002, when Dave Barry helped to publicize the event – which is how I, among many, originally came to learn about it. The following year, as ITLaPD was winding down, I decided that ninja should have a day of their own. After all, ninja and pirates have had a long standing feud with one another, and as is the case with political commercials, equal time to promote one’s agenda is only fair. Scouring the calendar for appropriate holidays, I happened upon December 5. Not only was this a Friday (as good a day as any for a holiday) it was the day that the Tom Cruise epic The Last Samurai was premiering. While samurai are not the same as ninja, some ninja were actually samurai; further, the film contained a scene in which ninja attack a samurai encampment, with some degree of success. The first year’s events were relatively small, but it caught on quickly. In 2004, a group of French performers decided to stage a photo shoot in front of the Eiffel Tower, an event they have faithfully replicated every year in front of a new French landmark. In 2006, the Ask a Ninja website got involved, releasing their DVD on December 5 of that year (the same day that Pirates of the Caribbean: Dead Man’s Chest was released). Last year was the biggest year ever; not only did several video game companies release ninja-themed game announcements on that day, but several media outlets got aboard, including NPR’s Morning Edition and G4 television (which ran a Ninja Warrior marathon that day). One of the interesting things about the holiday is that as it’s gotten bigger, it’s gone more underground. I originally organized forums and, later, a wiki dedicated to helping people organize events, but recently Facebook, MySpace and other social networking sites have decentralized things. The net result is that more people are getting involved, which is exactly what I had hoped would happen back in 2002. So you may be asking yourself, what can I do to celebrate the Day of the Ninja? Well, if you live in The Netherlands, you can celebrate by dressing up as a ninja for Sinterklaas. If you live anywhere else, you can dress up as a ninja just for the heck of it. You don’t need to go full ninja, of course; just a t-shirt tied on your face for a mask will do, or even a black t-shirt and black jeans. Can’t pull that off? 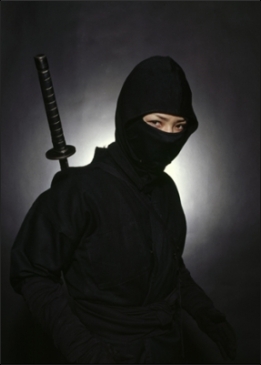 Try the ultimate ninja disguise – a t-shirt or nametag that says “Not a ninja.” Just the thing to sneak up on unsuspecting foes. Counter to ninja instinct, another excellent way to get involved is by taking photos and video of you and your friends gathering together while in ninja regalia. 364 days a year, ninja are encouraged to be sneaky and unseen, but this one day we feel it’s helpful to let the world know that we’re out there. After all, how can you truly fear something unless you get to see it once in a while? To that end, it’s also important to get the media involved. We need to spread the ninja message of fear to the whole world, so for starters you need to tweet, blog, Flickr and otherwise get your message out there. Post your photos and videos. Then call the local TV and radio station. Get the newspapers involved. Promote, promote, promote. Of course, dressing like a ninja and getting filming is just the start; this wouldn’t be a holiday without some events. Why not throw a ninja party, or play some ninja games, or perform some ninja tricks or stunts? Think of it as Halloween and the Fourth of July rolled into one, except without any candy. Sneak up on your friends. Toss some paper shuriken. Tape some “backstab me” signs to unsuspecting co-workers. Just nothing lethal or illegal – save that for the rest of the year, when no one is watching. Go out for sushi. Rent some Naruto DVDs. Be imaginative! 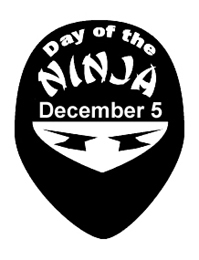 By far, however, the most important thing to keep in mind is that this holiday is NOT called Talk Like a Ninja Day. The reason for that is obvious – ninja are not known for talking. Thus, it is important that we as a ninja community make it clear to the world how different we are from our pirate brethren. Where pirates are loud, rude, crass, crude and obnoxious, ninja are quiet, polite, punctual, clean and above all else Freaking Awesome. The Pirates of the Caribbean movies might have thrown ninja out of the spotlight for a few years, but since the last movie fell on its face it’s time to regain the upper hand. Ninja costumes have outsold pirate costumes. Batman is back in the theaters. Several high profile ninja movies are in the works, and several big ninja video game titles have come around for another go. There’s no better time to be a ninja, and on December 5, there’s no better time to let the world know where you stand. The Day of the Ninja is upon us. Go ninja, go ninja, go. Written by Michael “Aeonite” Fiegel. For more information on the Day of the Ninja, visit Ninja Burger.